We may see prices this year look similar to last! 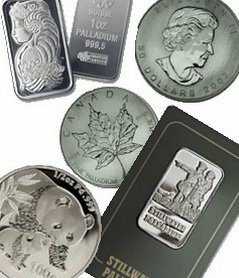 Today Au is at $975/oz and platinum is right around $1100, keeping just ahead of gold. Ag is making its move and is up to $14/oz. Palladium, as we know, is the slowest mover and will follow after the others have moved closer to their peaks. Palladium is right now at $222. But remember, Au didn't drop too much from its $1000 high of last spring. Ag and platinum were approximately cut in half. Remember though, palladium fell by two-thirds, from around $600/oz to under $200/oz. It's the most volatile for sure. No one knows where Au will stop, but if it moves up say, $5/day, and ends up around $1025/oz, I'm sure we'll see at least $1600 platinum and $18/Ag. Palladium would probably only reach $400. But, if Ag did hit an all time high of say $1050/oz, then we'd probably see $2000 platinum, $22 Ag, and $600 palladium. When the price dips I have to sell. I need money right now as I'm investing in real estate as well. Real estate isn't really comparable to the precious metals market in volatility, but if you work hard you can make money in it faster than you can in the palladium/gold/platinum market.